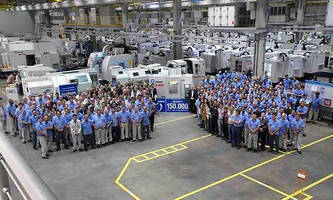 Industrias Romi SA, the Brazilian parent company of Romi Machine Tools in Erlanger, KY, has reached a milestone in its 80-year history--shipping machine number 150,000. To celebrate, Romi held a ceremony at its Santa Barbara d'Oeste Plant 16 for delivery of the machine. The machine, a Vertical Machining Center (Romi D800), was delivered in the presence of Romi directors and employees, and customer representatives (ZHS Industria e Comercio Ltda., of Brazil), and BNDES, the bank that financed the purchase. During the event, Romi CEO Livaldo Aguiar dos Santos, spoke to attendees about the importance of core principles in the conduct of the company's business. For Santos, "Romi's growth is directly related to its ethical values based on sound business principles that combine creativity and innovation." Santos also pointed out the importance of motivated employees who provide a constant source of ideas and justify Romi's huge investment in training and professional development. "In Romi's 80 years we've had more than 25,000 employees, many with 30, 40 and 50 years of service. Now, we are 2,800 collaborators, working in Brazil, Italy, Germany, Britain, France, Spain and the USA, who share a unique culture focused on innovation and quality," added Santos. Participating in the international market since 1944, Romi is the largest Brazilian manufacturer of machine tools (lathes and machining centers) and plastic processing machines (injection and blow molding machines). Its facilities encompass over 140 thousand square meters, divided into nine plants in the cities of Santa Barbara d'Oeste - company headquarters - Grugliasco and Pont Canavese, in the Turin area, Italy. In addition, the company has commercial subsidiaries in the United States, Germany, UK, Spain and France, with products and services sales in more than 60 countries.